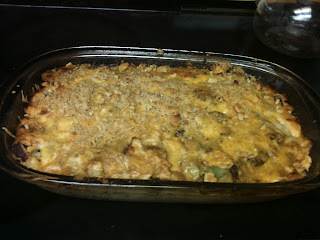 I'm not sure what the "Divan" is in Chicken Divan so I am not sure if this recipe would still be called Chicken Divan. I adapted this recipe from Passionate Homemaking, and I absolutely love it. What makes it so simple is that for the most part you can modify it based on what's in your kitchen. Combine soup, yogurt, curry paste, lemon juice, garlic and pepper. Layer ingredients: Rice, vegetables, chicken, top it off with the sauce (all of it) crumbs and cheese. Bake in pre heated oven, 350, for 25 minutes. I've made this with mixed veggies (cauliflower, carrots, broccoli), stir fry veggies, peas and carrots. All taste great! This most recent time, I made my own cream of chicken soup, and added 1 tub of Marsala sauce that I had frozen in the freezer (about a half a cups worth). Curry paste is a little pricey, but a little goes a long way. 1 jar contains 12 servings (24 tablespoons) and I only use 1 tablespoon in this recipe. I have not made the recipe with the curry powder. The original recipe calls for mayonnaise, which I do not use. I use yogurt instead. You can use mayonnaise or sour cream. If you are short on time and want to skip the oven step, microwave veggies until soft. Add veggies, soup mixture and chicken to the rice. Set stove to low and sprinkle with cheese. Cover until ready to serve.